My goal is to make magic for my clients when planning a Disney vacation. Family travel to Florida, Hawaii and European destinations are also part of my expertise. 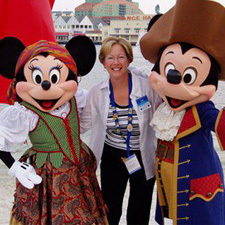 I am a specialist in Disney Destinations – Walt Disney World, Disneyland, Disney Cruise Line, Disneyland Paris, Adventures By Disney and accredited with Disney as an Authorized Disney Vacation Planner. Having completed The College of Disney Knowledge Agent Education Graduate & Master Programs and visited these amazing destinations numerous times, I can offer families a memorable experience of their own! It is important to know my client’s unique expectations and needs. I assist in extensive itinerary planning so they will get the most value…and experience the most magic! Of course, there are some special Disney secrets I can share to make their vacation a perfect one! Julie was instrumental in making our Disney vacation a success. This is a trip that for a family who has not been to Disney you need a helping hand. She walked us through the hotel, the magic bands, the meal plan, the fast passes, the reservations, the parks..EVERYTHING. WE had some items that were on our bucket list to do and while planning when we got our reservation at Be our Guest, she was just as excited as we were to get in. Its as if she was going to be traveling with us. You felt her passion, knowledge and enthusiasm for the brand throughout the whole process. She was a big part in making our Disney vacation MAGICAL!!! We had a wonderful vacation and would never book a Disney vacation without using Julie.